Time to replace your outdated Windows console! Take Command is a comprehensive interactive GUI and command console toolset. Take Command makes your Windows command prompt faster, easier to use and far more powerful. Take Command runs console applications in tabbed windows, with an optional Windows File Explorer interface available for those times when you need a visual look at your folders (or drag & drop to the command prompt). And Take Command includes a Windows CMD command shell replacement that makes you immediately much more productive at the command line. Take Command includes hundreds of major enhancements to CMD commands such as COPY, DEL, DIR, MOVE, SET and START. And it adds a batch file IDE and debugger, more than 245 internal commands, improved input line editing (including a variety of cut and paste options), syntax coloring, customized tab filename completion, and thousands of other features. Why Should I Replace CMD and the Windows Command Prompt? The default Windows command processor is CMD.EXE. It is a console application that executes the commands you enter at the prompt and runs simple batch scripts (files with a .BAT or .CMD extension). Unfortunately, the CMD shell has always been woefully lacking in even the most basic features compared to the command processors available in other operating systems. And CMD hasn’t changed significantly since its first appearance in Windows NT 3.1 (which was released in 1993). CMD can set its foreground and background colors, and … nothing else. No different colors for input and output, errors, colorized directories, or syntax coloring. Take Command is our flagship product. Take Command is a complete Windows console and CMD replacement that solves all of the problems above, and provides you with a vastly better command prompt UI, a batch programming IDE with syntax coloring, and thousands of additional features not available at the CMD command line. Learn more about Take Command. For the last 30 years, JP Software has been helping programmers, system administrators, technical support professionals, and advanced users save time and solve their Windows command prompt frustrations. Take Command offers a new approach to working with Windows command line applications, bringing users the power of the command line and the ease of use of the GUI. "We all know that the only officially-sanctioned way to interact with modern computers is by pointing and clicking on hieroglyphic icons. But many tasks are more easily done with an “old fashioned” command line. JP Software’s Take Command for Windows ($99 for new users, $49 for upgrades) is a powerful replacement for Microsoft’s Command Prompt (CMD.EXE). If you’re a software developer, system administrator, or a “power user” who spends any significant time using the Command Prompt, you’ll surely find Take Command a tremendous improvement. It adds hundreds of powerful commands and enhancements, and incorporates a number of commonly used console-mode utilities." Take Command combines the power of the command line with the ease of use of Explorer. Organize all of your console (character mode) applications in tabbed windows, and manipulate files at the command prompt and graphically see the results. Take Command is a Windows console replacement, and is compatible with your existing CMD console commands and batch files, while adding thousands of new features. It's fast - 20-200% faster at displaying output than the standard Windows console, saving you time and money. The consistent command syntax reduces your learning and development time. The comprehensive help (including context-sensitive popup help for command syntax), speeds your development time and reduces syntax errors. Create and debug your batch files in a fraction of the time with Take Command's integrated batch file editor and debugger. Take Command is fully customizable, including themes, colors, menus, keyboard shortcuts, toolbars, and windows. You can run multiple command line and GUI applications simultaneously in tabbed console windows, including CMD, bash, PowerShell, and our own Take Command Console (TCC). 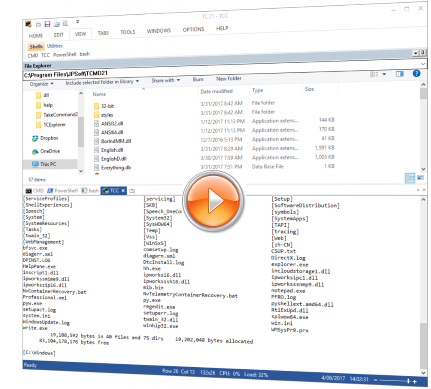 The integrated Windows Explorer file manager allows you to examine directories and drag and drop files to console applications in the tabbed windows. The built-ins creen scrollback buffer lets you review or print command line output from past commands, and find text in the tabbed windows. The programmable tabbed toolbar lets you create up to 20 tabs with up to 50 toolbar buttons on each. Toolbar buttons can start new tabs or windows, or send commands or text to existing tabbed windows. Redefine your commands through aliasing, create new commands and functions for your regular tasks, and assign frequently used commands to a single keystroke. Take Command not only runs your existing CMD batch files, it runs them faster than CMD. Create and debug your batch scripts with the integrated graphical IDE. The IDE includes tabbed editor windows and a sophisticated debugger with single stepping, breakpoints, syntax coloring, tooltips, bookmarks, tabbed variable and watch windows. Batch file programming has never been easier or more powerful! The TCC scripting language is a massive superset of CMD, with 246 internal commands, 397 internal functions, and 299 system variables. Almost all of the CMD commands (e.g. DIR, COPY, DEL, START, etc.) are enhanced, with hundreds of additional options. And TCC adds more than 200 new commands. Take Command can usually do in one or two lines what requires dozens of lines in CMD (if it can do it at all). Most TCC commands (such as COPY, DEDUPE, DIR, DEL, MOVE, REN, etc.) have command dialogs that allow you to select filenames and options and see your command line before executing it. The most powerful Windows command processor is also the easiest to use! Environment variable handling is greatly enhanced, including nested variables, indirect variables, delayed expansion, multi-dimensional array variables, and access to the system, user, and volatile variables in the registry. The file handling commands allow you to select or exclude files by date, time, size, owner, description, and extended wildcards or regular expressions for extraordinary flexibility in file management. TCC supports multiple types of redirection, including redirecting and piping to STDERR, "here-document" and "here-string" redirection, and TEE and Y pipe fittings. The optional input edit window (with full undo/redo) allows you to create and edit commands before sending them to the active tabbed windows (or console or GUI windows). Send keystrokes from aliases or batch files to any application (console or GUI). Colorize your command line with TCC's syntax and directory colorization, input, output, error, and selection colors, and ANSI x3.64 support. Take Command includes the best text and binary file viewer available for Windows, including bidirectional scrolling, hex listings, rulers, grid lines, extensive searching (including regular expressions) and printing features, and much more. Easily find (and optionally switch to) any directory on your system by entering only part of its name with extended ("fuzzy") directory searches. Customize your directory displays with PDIR (a programmable DIR command). Take Command includes internal compression and extraction commands for ZIP, 7ZIP, TAR, and GZIP files. Monitor your system's hardware and software events, and execute commands when an event is triggered. You can monitor directory changes, the clipboard, event logs, network connections, services, processes, and USB and Firewire connections. You can access FTP, TFTP and HTTP (including SSL and SSH) directories and files in all command line file-handling commands (COPY, DEL, DIR, MOVE, etc.). Send SMTP, SMPP, and SNPP messages from your batch files. Create your own commands or variables with plugins, or choose from the many third-party plugin libraries. For more information, see the Take Command and TCC tutorials. Take Command is compatible with any 32-bit or 64-bit version of Microsoft Windows 7, Server 2008R2, Windows 8, Server 2012, Windows 10 and Server 2016. There are two editions of Take Command, so you can use the version that's perfect for your needs. See Comparing Take Command, TCC/LE, and the CMD console. Learn more about: Windows CMD Command Prompt Commands. Windows Batch File Programming.